The above quote is the quintessential theme of Relativity, a new play by Mark St. Germain performed at TheaterWorks Hartford. It’s only tangentially about the genius and iconic personage in history; the image of the frizzy-haired guy we see on the cover of books, stamps, buildings, magazines, and hospitals; the scientist who wowed the world with his theory of relativity E = mc2 and other amazing insights. Indeed, if you are thinking you will be barraged by Einstein’s scientific and mathematical legacy, then you’ve come to the wrong play. Rather what you will see is a real, three-dimensional human being complete with flaws, doubts, anger, insecurities, and countless other trappings of the human condition that plague all of us. 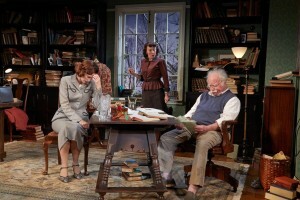 Prior to this play, I knew very little about the man known as Albert Einstein. I had no idea that he had been married and had children including a baby daughter. 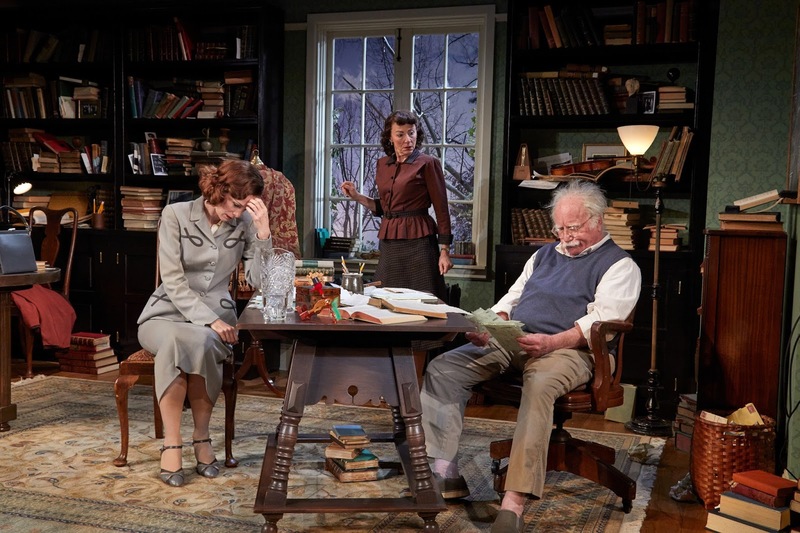 The play uses both fact and fiction (more commonly referred to as “faction” in today’s historical pieces) to theorize a confrontation between Einstein the man and his long-lost daughter. Although I am oversimplifying the plot to avoid spoilers, suffice it to say that the action is anything but dull. Indeed, the play is riveting, its canvas filled with broad brush strokes of comic relief, historical facts and trivia and, most important of all, the dynamics of human relationships. The cast of three is simply wonderful. One of the high points in my theatre-going career was having the opportunity to see Richard Dreyfuss, George Rose, and Rene Auberjonois in the 1978 BAM Theater Company’s Julius Caesar. Mr. Dreyfuss literally had won the Oscar for The Goodbye Girl the night before and was fresh off the plane from Hollywood. 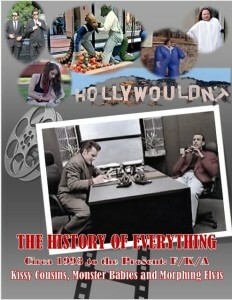 It was a theatrical moment in time for me as young culture vulture that I will never forget. I must rank watching an albeit older Mr. Dreyfuss, but still exuding enormous talent, stage presence and charisma, as yet another highpoint in my theatre-going career. His accent, mannerisms, and wry sense of humor as the famous scientist were all spot-on and I wondered how much time he spent studying old films of the real Einstein to get such a handle on the character. Mr. Dreyfuss also was excellent at portraying the human frailty and foibles of Einstein the man. 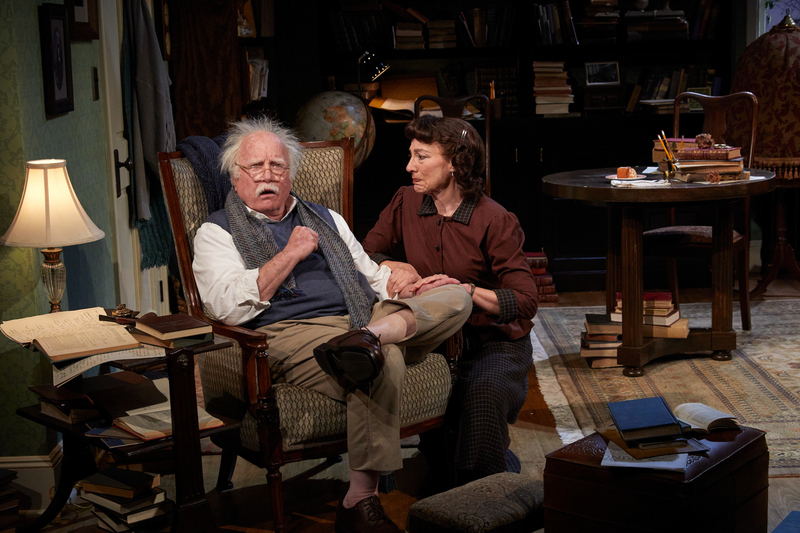 Christa Scott-Reed gave an incredibly layered performance as Einstein’s purported long-lost daughter, mixing just the right amount of anger, resentment, curiosity, and awe. While all of the characters have humorous moments, a great deal of the comic relief comes from Lori Wilner as Helen Dukas, Einstein’s zealously overprotective housekeeper and personal assistant. 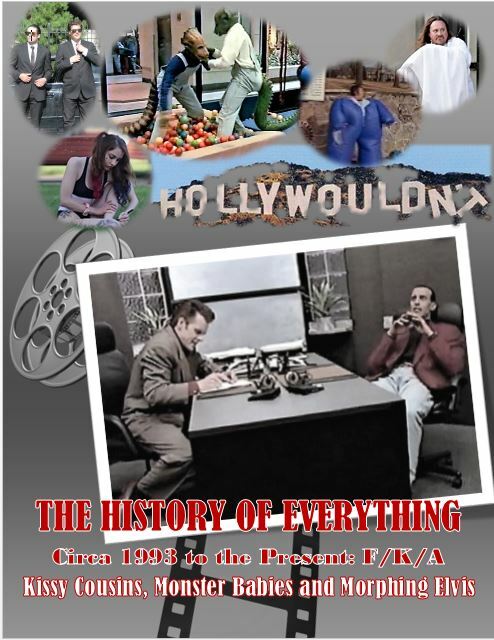 TheaterWorks’ artistic director, Rob Ruggiero, has notched another masterful directing credit on his ever growing belt of prestigious theatrical accomplishments. He (with his cast and especially Mr. Dreyfuss) is able to take an icon like Einstein and portray him as mere mortal like the rest of us with clay (and barefoot) feet. 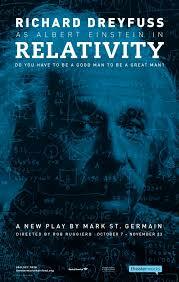 A special shout out to playwright Mark St. Germain for his insightful and creative “theory” of relative-“ity” vis-à-vis Einstein’s personal life. Einstein once said that “imagination is more important than knowledge.” Based on that criteria, I am certain that Albert Einstein (the man) would have given the play Relativity two thumbs up. A number of years ago I was doing research about Albert Einstein with my then seventh-grade son for an extracurricular engineering/inventor project. Up until that point, I only had known about the great Einstein’s scientific accomplishments; about the man (other than his famously kooky gray hair and mustache), I knew little. I recall feeling a new appreciation for him in what we’d discovered of his love for humanity and the generosity he’d been reported to show others; I’d learned that he was patient and humble, often taking time to explain his complex theories and other scientific matters to those far less able to wrap their heads around his cerebral works. So I was eager to know more about this charitable, but resolute genius and thrilled to have had the opportunity to take in Mark St. Germain’s new play, Relativity, at one of my very favorite venues, Hartford’s TheaterWorks. 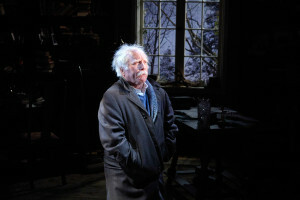 I also admittedly was bordering a bit on celebrity worship as I giddily sat just a mere few feet away from the great Oscar Award-winning Richard Dreyfuss who masterfully portrayed Einstein. A speculative dose of fiction, Relativity chronicles a part of Einstein’s life about which many don’t know, nor has there ever been much in the way of definitive answers. Woven around the mysterious circumstances of the 1902 birth and subsequent disappearance of Einstein’s first child, a daughter, Lieserl, St. Germain takes an intriguing stab at rewriting history. The play opens to find Einstein at his home in Princeton, New Jersey; a testy yet charming old codger with a doting albeit unyielding housekeeper named Helen Dukas (played superbly by Lori Wilner) who may or may not have had other “duties” or at least some other kind of relationship with the sockless genius (he famously never wore them). We immediately are entranced by Einstein’s quirkiness, so brilliantly brought to life by Dreyfuss – but he’s not the same man about whom I’d read. Here he’s tough, obstinate, and more than a bit temperamental. He seems to enjoy solitude and is estranged from his family. His genius did not make him infallible – in fact, he was quite imperfect we learn – his public face juxtaposed against this private persona. When a beautiful and persistent journalist named Margaret Harding (a fabulously strong performance by Christa Scott-Reed) forces her way past gatekeeper Helen, she opens a can of worms about the life and whereabouts of his long-lost daughter; for Albert, a container far better left sealed. We are given to wonder where the truth lies; and we may ask why the man who so tirelessly and significantly changed the entire landscape of the scientific world could not master his own social world. With intelligence and humor, St. Germain peels back the layers of the onion, exposing beneath them, something raw and altogether human. And it was with a sure hand that TheaterWork’s own artistic director, Rob Ruggiero, directed this dynamic trio through an incredibly serious, emotional, and thought-provoking ride. I must shout out to Brian Prather for a detailed and delightful set design (often one of my favorite parts of the gestalt); and Alejo Vietti for costume design (which must have been made easier without socks as a final accoutrement). Kudos also to Philip S. Rosenberg for lighting design, Michael Miceli and Lucas Clopton for sound design, Leah Loukas for wig design, McCorkle Casting, Ltd., Bridget Sullivan as production manager, Kate J. Cudworth as stage manager, and Robert H. Davis as dialect coach. Less about the “father of modern physics” and more about the father of three, the husband, and the man, Relativity will enlighten, entertain, and enthrall. Thank you TheaterWorks for always presenting us with something extraordinary!